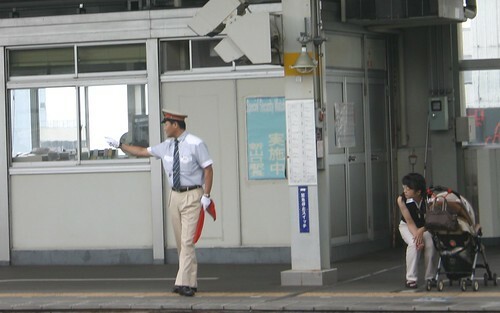 As a bullet train (shinkansen) comes in to Shin-Yamaguchi Station, the guard on the platform points at something that needs to be checked, perhaps the fact that there is a train coming. According to my survey, finger point safety checks do not occur in the UK, the US, Australia and China. In Japan they are found to decrease the rate of accidents by up to 50% so they are are a duty. The staff take them very seriously, pointing to each of the signs and objects that need to be checked. In the UK railway system, a similar practice is "calling the road," which refers to saying the colour of each signal and sign as one passes it. Someone tried to introduce finger pointing safety checks to Australia but the railway staff laughed and refused to take part.